A friend of mine lost his job last December, around a week before Christmas, due to the company’s decision to cut costs. That was a really devastating experience for him, and another proof that having a job as your only source of income can be dangerous. Anyway, I’m glad that my friend is now back on his feet, and busy applying for a new job. 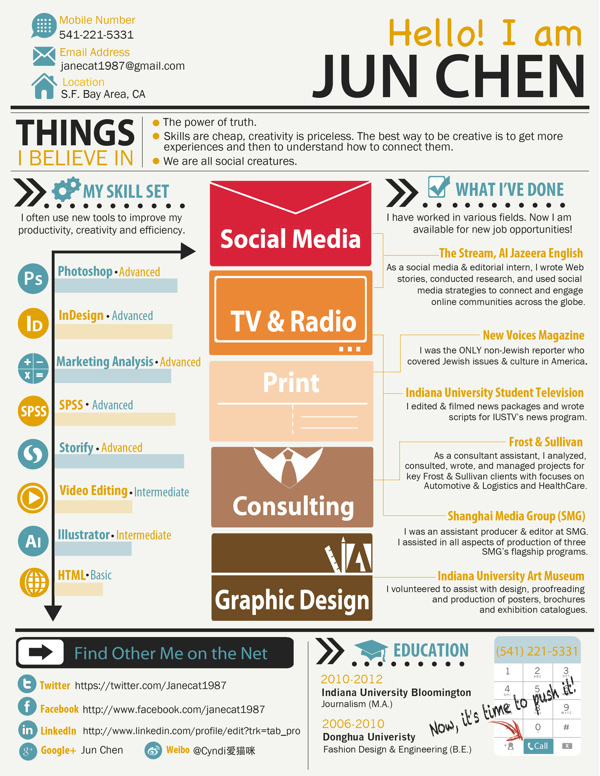 He just updated his resume and I was at awe when I learned and saw that he made an infographic resume. It’s simply a graphic representation of your skills, experience and education. It’s usually used by people seeking work in creative industries such as web design, photography and art. But more and more people, specially those working in social media, are using it to give their resume an extra boost of attention and recall. 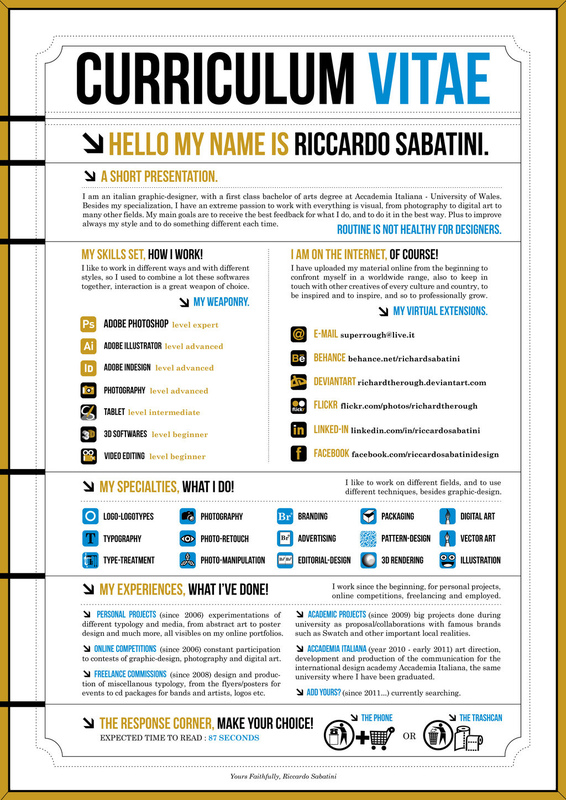 To help you understand better what an infographic resume is, specially how it looks like, here are some examples below. Just click the image to get a closer look. If you want to see more examples, there are a lot of them HERE. There are a lot of websites that offer this service, some of which are Kinzaa and Visualize.Me. These online services use your LinkedIn profile to create the template. However, doing one on your own, asking an artist friend, or hiring a graphic designer to make one for you is a better option; because it will make sure that your design is unique and relevant to your personality. Plan your content. Make a text resume first and then work on a layout. Sketch several design studies and see which one will appeal to you most. Choose a good color scheme. Decide on a primary color and 1-2 secondary colors. Use color psychology to enhance your character. Consider your medium. Are you going to send this as a digital file, or are you going to print it? If it’s the latter, what paper or cardboard are you going to use? Your design should have the same dimension, and it’s best to use standard paper sizes. Print a sample and ask for feedback. 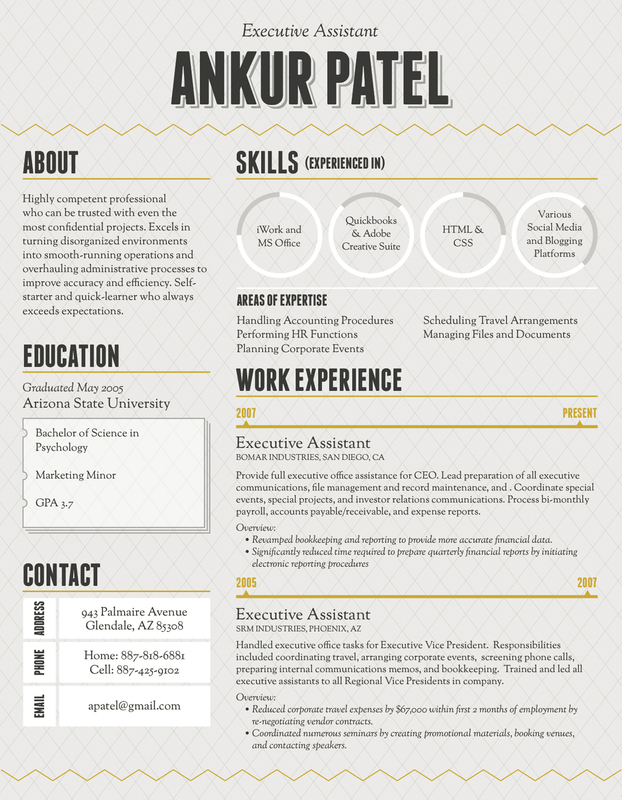 Your infographic resume should have a good balance of text and graphics. It should look organized, professional, and the graphics should represent the right information. Personally, I believe that you should either do it well, or not do it at all. So if you don’t have the creative skills, or can’t find someone who can do it for you – then just stick to the classic text resume. A traditional CV can still look good visually. Experiment on fonts and text colors, as well as different layouts and types of paper – and I’m sure, it will look as great. Lastly, remember that in the end, it’s your skills, talents and work experience that matters. Your colorful graphics can only take you as far as getting the attention of your potential employer. In the end, it’s the one best suited for the job that gets hired. Base on what you share sir Fitz, I updated my CV and put a logo of my previous company and did little enhancements. Since my previous and current company are global leader in their respective field and globally recognize brand, I believe it will give recall to every one who will read it. It’s cool. Thanks. Indeed Lonora… it is very, very traumatic. I know somebody (not the guy in the post) who lost his job and hid it from his family… he pretended to go to work for almost a month. All that time, all he did was go to the mall and walk aimlessly the whole day. He came clean only after his wife called his office because she couldn’t reach his mobile phone, and she learned about what happened from his colleague. It took him almost a year to recover emotionally from that experience. It’s true that losing a job is way too painful. I had similar case with mine, for now that I’m undergo an analytics apprenticeship. 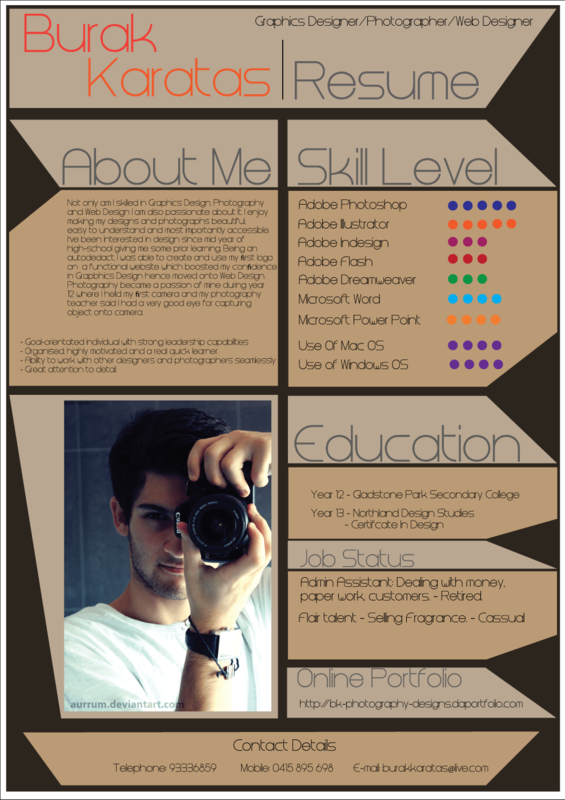 Although that I have an ample knowledge about infographics via piktochart, I never knew it can be used as a resume. and I have internship this coming April. then I saw your article! who are going to apply for internship? Hi Nerisa… as an fine art student, I would say it’s a great idea to have an infographic resume when you apply for internship. But I’d recommend that you still prepare a traditional resume, because the HR department usually prefers to keep this version for their records. Thank you so much for the respond Sr Fitz! and the article was really helpful!